I'm back again with another card I made for a sketch challenge. I really like Tuesday Morning Sketch Challenge this week so decided to play along. I went to Scrapfest in Kitchener last week Saturday in spite of the snow and freezing rain we had here in Southern Ontario. I saw a demo of Heartfelt Creation's new 3 D Flower shaping mold which I have had my eye on since I first saw it on the Heartfelt Creation's website. I already have the Deluxe Flower Shaping Kit but it is rather hard on the hands. The mold is so much faster and easier to shape flowers. I had already stamped and die cut this flower using SU's Cherry Cobbler on pink card stock and the leaves with SU's Garden Green ink on moss green card stock and shaped them using the mold as well as the flower shaping kit. I started off with an ivory card base and then added the rose design paper from Joycrafts. I die cut the squares and then used my Hampton Art Stamp Perfect to center the sentiment which was stamped using SU's Garden Green ink. I then adhered the squares with a tape runner. I adhered the flower using Aleene's Quick Dry tacky glue. The sparkly enamel dots are by Your Next Stamp which is a Canadian company that makes stamps, dies, paper pads and they have a huge selection of enamel dots. I love how this card turned out and even hubby was duly impressed. This card will be going to my daughter who is the mother of my 3 adorable granddaughters - Sierra 12, Brooke 10 and Amber 7. The girls keep their parents busy with hockey in the winter and softball in the summer. My husband and I love going to their hockey and softball games and cheering them on. Thanks for stopping by and don't forget to say Hi so I can visit your blog!! I was very happy when I saw the inspirational photo for this week's challenge at Merry Monday. I have the perfect die for this challenge and couldn't wait to play along! I started with SU's Cherry Cobbler card stock as my base and then added a layer of ivory card stock by Bazzill which I die cut using a Your Next Stamp die - Layered Rectangles. The candle die cut as well as the sentiment die cut were cut from SU's Cherry Cobbler card stock. I used double sided tape sheets when I cut the dies to adhere to the card front. So much easier than using a glue pen! The sparkly gold enamel dots are by Your Next Stamp which is a Canadian Company. 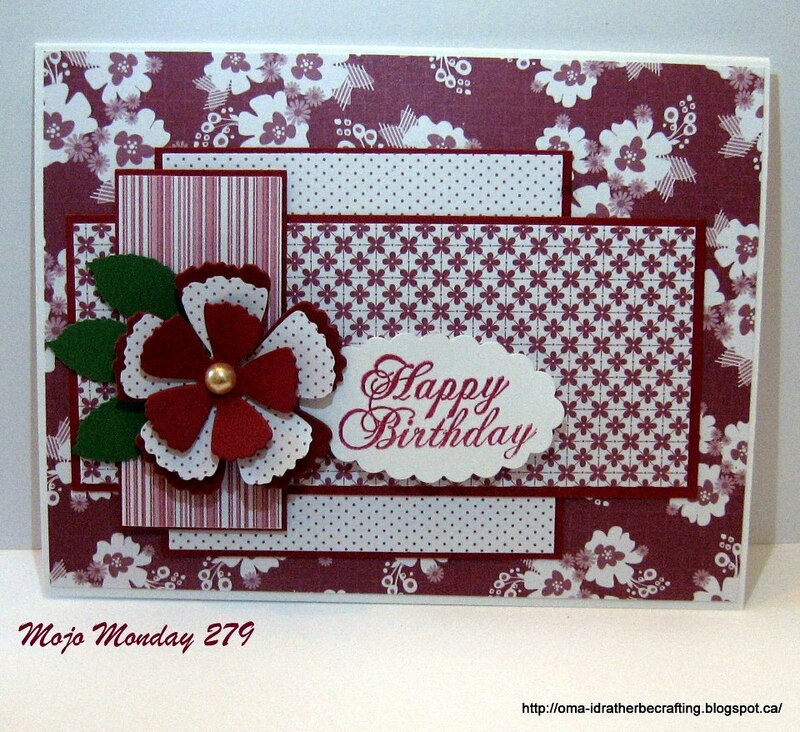 I love the colour combination of Ivory and Cherry Cobbler and use them a lot when making cards. I enjoyed making this card and am happy that I have at least 1 less Christmas Card to make for this year. I started off with a white card stock base and then added the embossed cardstock. The embossing folder is by Darice and all the card stock I used is by Bazzill. I die cut the flowers and leaves which are from Creative Expressions - shaded peony. This die set also has co-ordinating stamps but I chose not to stamp them this time around. The sparkly white enamel dots are by Your Next Stamp which is a Canadian company. Your Next Stamp has all kinds of dies, matching stamps, paper pads and embellishments and I am looking forward to seeing them again this year at Scrapfest on April 14th in Kitchener ON. I cannot remember who the sentiment is by but I stamped it using SU's Cherry Cobbler which just happens to be my favourite colour. It is such a beautiful deep maroon and I have both the card stock and ink pad. I love how this card turned out as it reminds me that warmer days are ahead. 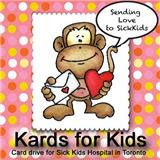 When my husband had a stroke on Jan. 26th, my card making mojo flew out the window. I am happy to report that he is doing very well thanks to our excellent health care system. When I called 911, the paramedic arrived in about 2 minutes followed by the ambulance 5 minutes later. He spent a week and a half in hospital where they started physio and speech therapy. After he arrived home, he received both physio and speech therapy at home and it was covered by our provincial health insurance. On Wednesday he was able to go back to curling and is looking forward to golfing when the weather warms up. To say he gave us quite a scare would be putting it mildly. I am just grateful that it happened at home and not an hour earlier when he was driving. 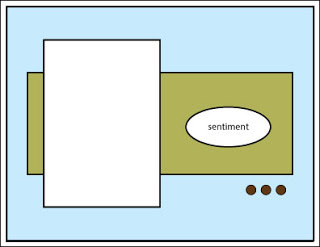 Card stock is by Bazill. The sentiment die is by Stamps of Life and the butterfly dies are by Your Next Stamp. The embossing folder is by Darice. I added some white pearls to the butterflies as well as some yellow enamel dots to the flower centres and to the card. I like how this card turned out and it makes me happy knowing that warmer weather, butterflies and flowers will soon be here. I am so tired of winter! 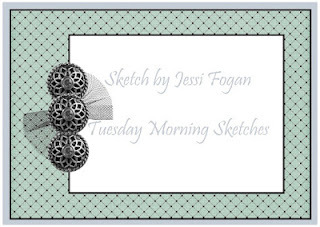 Sunday Stamps has a sketch challenge that I really like so I decided to play along this week. 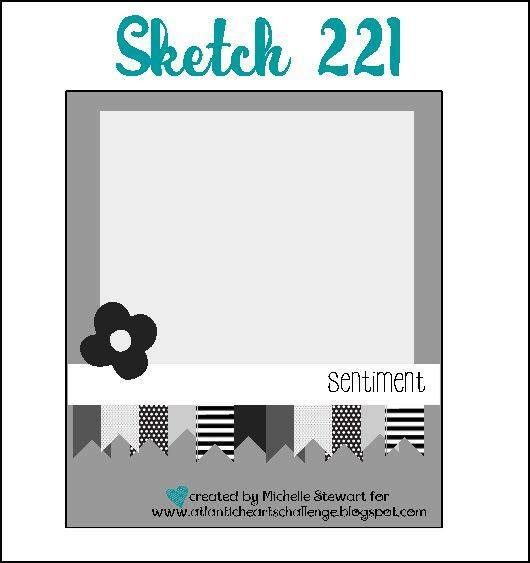 I started with a white card stock base and then added the striped design paper from my stash. I die cut the squares and oval. Then I stamped and die cut the cupcakes which are by Spellbinders. I coloured the cupcakes with my Spectrum Noir coloured pencils and added some Wink of Stella to the icing on the middle cupcake. 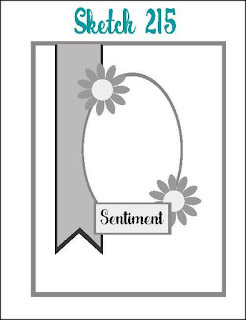 I stamped the sentiment which is also from the same set as the cupcakes onto the oval die cut with Versafine Majestic Blue ink. I added the blue rhinestones as I love adding embellishments to my cards. 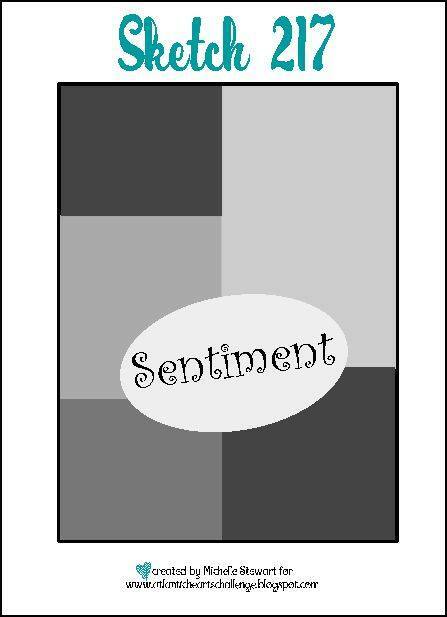 I am quite pleased as how well this card turned out and feel that it could be given to either a man or a woman. The Atlantic Hearts Sketch this week has another fabulous sketch which I really love so I decided to play along again. I started with an ivory card stock base. I cut the squares from SU's Cherry Cobbler and Ivory cardstock with stitched square dies. I had some very narrow pink ribbon which I added. I am not a big fan of twine or washi tape. The flowers were stamped onto pink card stock with SU's Cherry Cobbler ink and then die cut using the matching dies which are by Creative Expressions Shaded Peony. I love this set and have made quite a few cards with them. The leaves were punched out of green cardstock. I added yellow enamel dots to the flower centres and also added 3 burgundy enamel dots. The enamel dots are by Your Next Stamp which is a Canadian company. The sentiment which is by Stamps of Life was stamped onto the ivory square using SU's Cherry Cobbler ink. I used my Stamp Perfect by Hampton Arts to stamp the sentiment. Hampton Arts does not make the Stamp Perfect anymore as it is an exact duplicate of the Misti and due to copyright laws they had to discontinue selling it. I was lucky enough to buy the Stamp Perfect at Michaels with a 50% off coupon which meant that I got it for $18.00 which is a lot cheaper than the Misti. I love it and use it quite frequently. 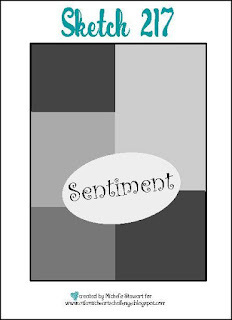 I like the fact that if the image or sentiment is not stamped perfectly you can easily stamp it again without worrying about whether or not the stamp is in the correct position. I love how this card turned out and the photo does not do it justice. It is much prettier in real life. I will probably send this card to a very close friend who lives near Moncton NB and who I don't see often enough. Donna and I have been friends since we met in Nursing School in 1967. We had a blast with each other getting into all kinds of shenanigans and we spent a week together camping one year near Omemee ON. While we were camping we went to the drive in theatre through the exit as there was no one in the booth to take our money and the gate was down. For the life of me I cannot remember the name of the movie that we watched! I love making cards using sketch challenges as inspiration. My pinterest board has loads of sketches saved. I love this week's SIP Challenge sketch and decided to play along. I started with a white card stock base and then added a layer of SU's Melon Mambo. The background design paper is also from SU. I added a border of Melon Mambo and then popped up the party design paper which I die cut using a round stitched circle die on pop dots. 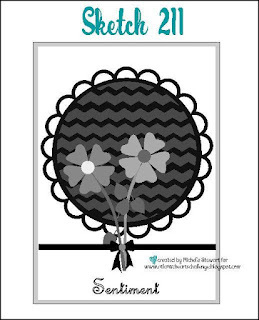 The party design paper is by Doodlebug - Sweet Sensation. I just bought 1 sheet of 12 x 12 design paper and should have bought more as I have already made 2 cards from it. I love this paper! I die cut the banner and the sentiment and then popped them up. I added some sparkly pearl gems by Forever in Time to add a bit more interest to the card. I had fun making this card and it will probably be given to one of my 3 granddaughters. I am a past design team member for AHSC. When I saw this week's sketch; I knew I wanted to play along. 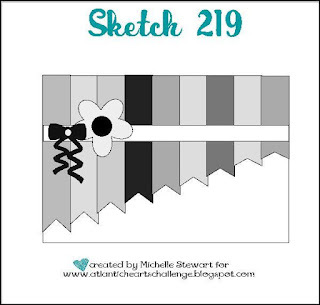 Here is the link to the blog post: Atlantic Hearts Sketch Challenge. The ivory card stock base and pink card stock are from my stash. The design paper is by Joycrafts. I die cut the flag banners, the circle, the sentiment and the ribbon. The small pink rhinestone butterfly and the pink flower on the ribbon are both from my stash of embellishments. I am very pleased at how well this card turned out. The most difficult thing to do on this card was centering the design paper on the pink card stock and also centering them on the card base. It's no secret that I love making cards and love following card sketches. When I saw this morning's sketch at Tuesday Morning Sketches, I wanted to play along. It didn't take me very long to come up with design paper, sentiment, embellishments and coloured card stock. It took me all of 15 minutes to make this card and I love how it turned out! I started out with a white card stock base and added a layer of green card stock, and a layer of design paper from a 6 x 6 paper pad - Here Comes Santa Clause by Doodlebug Designs. I then added a layer of red card stock and a layer of white card stock for the sentiment which was stamped with green ink. The red layer is popped up on 3D foam squares. 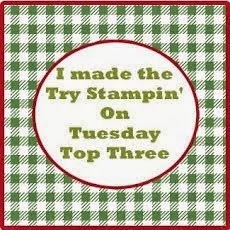 All the layers were die cut using stitched rectangle dies by Your Next Stamp. The three sparkly enamel dots are also by Your Next Stamp and the gold ribbon is from my rather large stash of ribbon. This is the 3rd Christmas card I've made for my stash so hopefully; I'll have enough Christmas cards made by the time December rolls around. I started out with a white card stock base and then added a layer of rose design paper which is from a 6 x 6 paper pad - Sweet Roses by Marianne Design. I die cut the white panel using a stitched rectangle die from Your Next Stamp. I added a strip of pink card stock and cut the roses which I believe is by Tattered Lace dies twice - once in green and then in pink and layered the pink roses on top of the green roses. The sentiment which was also die cut from the pink card stock is by Stamps of Life and the pink rose in the bottom left corner is by Spellbinders. I added a sparkly yellow enamel dot to the center of the rose. We would love to see what you create using the sketch and linking up. You might even be picked as a top three participant. I have thoroughly enjoyed being a member of the Design Team and will probably play along in the future. I might also sign up for another 6 month term. Hello everyone! 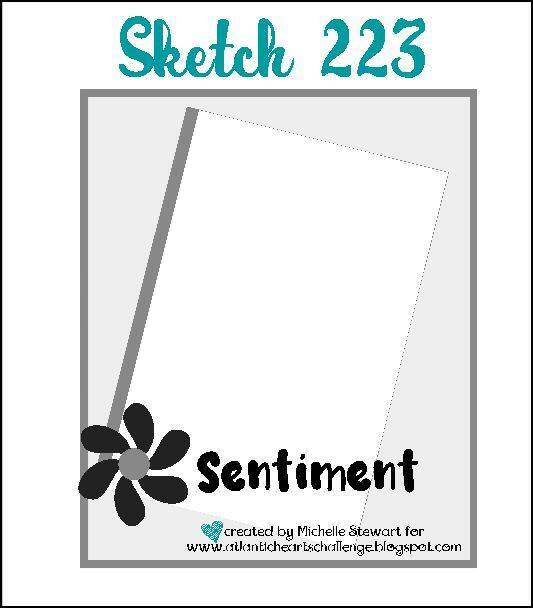 I'm back up on the Atlantic Hearts Sketch Challenge Blog. 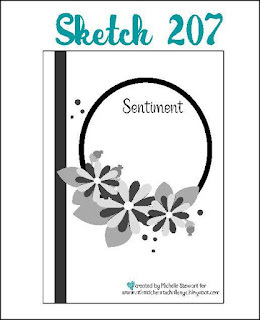 Michelle has provided us with a sketch this is similar to the AHSC #209. I love this week's sketch and I love the fact that it only took me about 20 minutes to make my card! 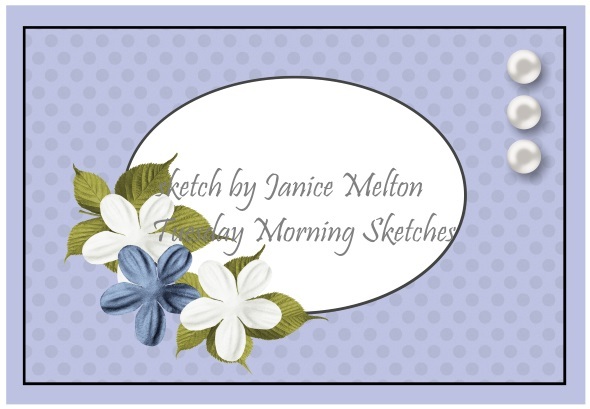 To be honest, almost all the cards I make start out with a sketch that I have pinned. The reason it only took me such a short time to make this card is because all the die cuts I used were already in my stash. The sentiment and banner die cuts were sent to me by a member of the Facebook group Canadian Die Cut Exchange. Every month the members who want to participate are paired up and they send each other die cuts as well as embossed papers using their embossing folders. I have been the recipient of a lot of die cuts which I've used and will be using on my cards. Truth be told, I have received some die cuts that I'm not sure what to do with but the majority of them are awesome! The flower I had stamped and die cut a long time ago out of some scrap yellow card stock. Whenever I have a small piece of card stock left over, I go through my dies and cut or punch out flowers, leaves, small butterflies etc. I hate to throw out small pieces of card stock. Waste not, want not! 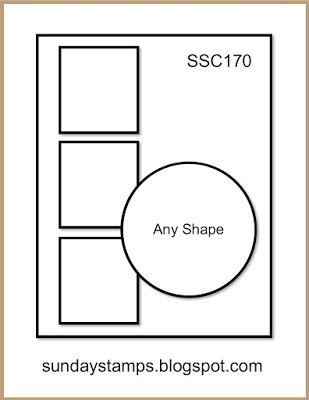 I had already die cut the white card stock square as well. I started my card with a white card stock base and added a layer of plaid paper from Lawn Fawn's Perfectly Plaid 6 x 6 paper pack. I then added the banner die cut, the white square die cut which I popped up on 3D foam squares. It was a bit fiddly applying the liquid glue to the sentiment die and that probably took the longest to do. I then added the flower and some adhesive gem stones from Papermania to finish off the flower and card. I love using embellishments on my cards and almost always add some bling or pearls. It was such a nice day today that I took the card outside to take the photo. I hope you can join us this week. 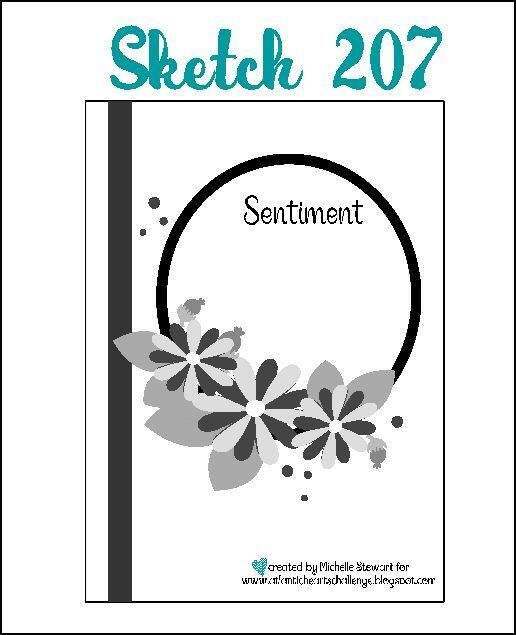 We would love to see what you make using the sketch as inspiration. 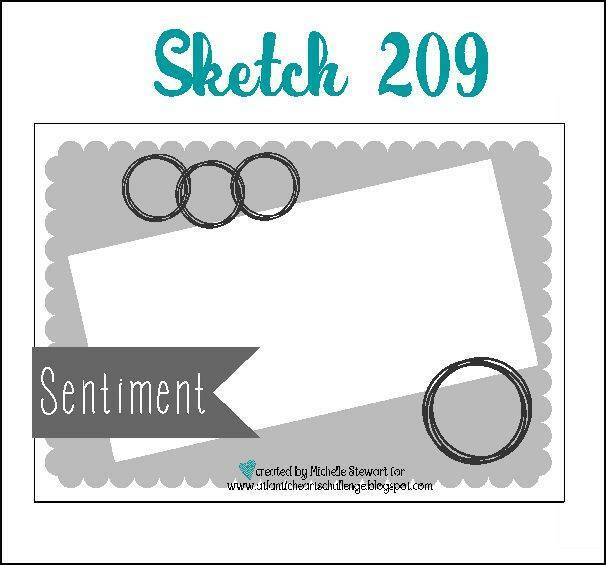 I love playing along with sketch challenges and when I saw this week's sketch challenge at Try Stampin' on Tuesday; I just had to play along. I started with a white card stock base and then added the green rectangle with the tulip design paper from Your Next Stamp. I die cut the yellow rectangle with a stitched rectangle die also by Your Next Stamp and the cross stitch oval die from Cottage Cutz. The sentiment is by Stamps of Life and I popped it up with 3D foam tape. The tulip die cut was cut twice in green and Melon Mambo by SU. I attached the Melon Mambo flowers on top of the green die cut. The tulip die is by Penny Black. I thought it was just the right size for the yellow rectangular piece. I finished off the card with some matte sprinkles by Doodlebug Design. I love how this card turned out. I started off with a white card stock base and added a layer of ivory card stock. The papers I used are by Dovecraft - Floral Muse. I am almost ashamed to admit that I have had this in my stash for a very long time and today was the 1st day I used some of the papers. I added a pale pink oval circle which was die cut and is by Cottage Cutz Cross stitch ovals. The sentitment which was stamped using Versafine Crimson Red is by Stamps of Life. I am quite pleased at how well this card turned out. I started out with a white card stock base. I die cut the banners with a stitched die and the ovals with a cross stitched die. 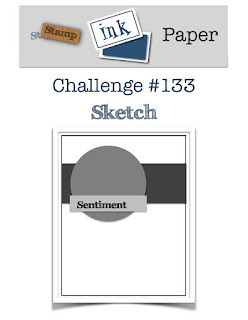 The design paper is from a 6 x 6 paper pad by Docrafts - Burleigh blue. This particular paper pad has all sorts of light and darker blue designs in it and is perfect for card making. 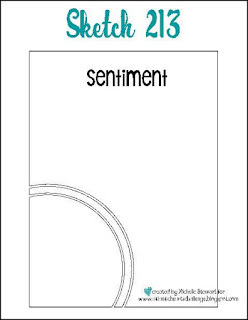 The sentiment which was stamped with Versafine Majestic Blue ink is by Kaisercraft. I added dark blue and light blue quilled flowers. I recently learned how to do some quilling. I also added a light blue and dark blue enamel dots from Your Next Stamp to the quilled flowers. I added 3 more dark blue enamel dots to the top right corner of the card as I thought it looked a bit bare. I love how this card turned out and I had fun making it. I hope you like this sketch as much as I do and will be inspired to make a card. I'm up on the Atlantic Hearts Sketch Challenge blog again this week with my interpretation of sketch #213 as part of the design team. I started off with a pink (Doll pink by Simon Says Stamp) card stock base. I then added a layer of Cupcake Swiss Dot by Doodlebug Designs which is part of the 12 x 12 paper pack - Cream & Sugar. 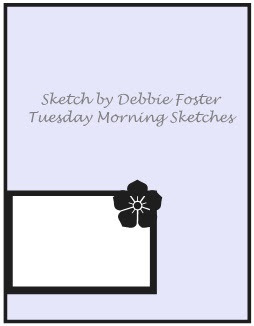 This particular paper pack has several different petite prints which are perfect for cards. I find that sometimes the 12 x 12 papers have prints that aren't really appropriate for card making as sometimes the prints are too large. I added the white swirly die cut and Happy Birthday die cut which I received from a member of the Facebook group Canadian Die Cut exchange. Each month the members send each other no less than 20 die cuts and embossed papers. I added the maroon pearls to give this card some interest. I am very pleased with this card and let's face it, you can never have too many birthday cards! 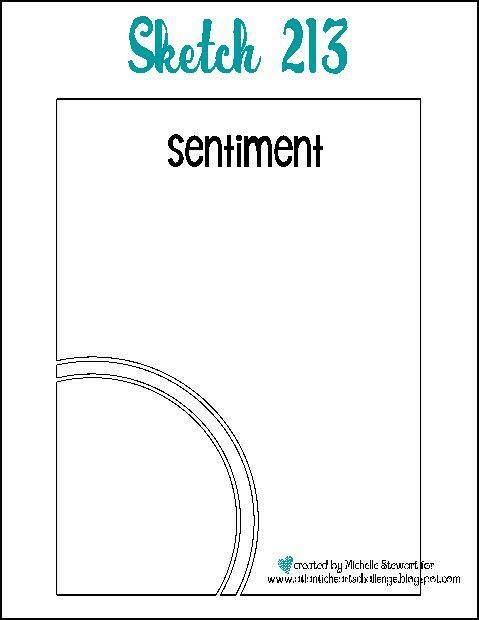 I switched up the circles on this card as I thought it suited the images I used better. White cardstock base and I added a layer of brown cardstock which I die cut with Your Next Stamp stitched rectangle die. I then added a layer of the coffee bean design paper with another stitched rectangle die from Your Next Stamp. The design paper is from Doodlebug 6 x 6 paper pad Cream & Sugar. I love the papers in this paper pad! 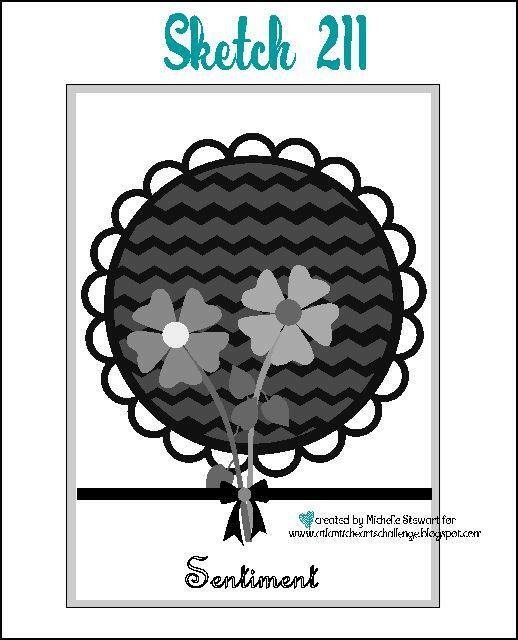 I also used the shape sprinkles on the stitched circle die cuts from Doodlebug which match the papers in the paper pad. The sentiment which I stamped with Versafine Sepia ink onto the stitched rectangle die by Your Next Stamp onto kraft card stock is by Elizabeth Craft Designs "Coffee & Tea". 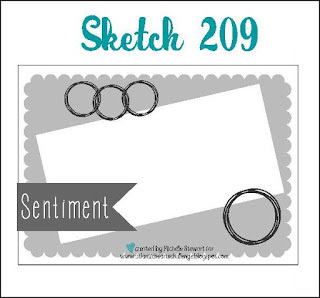 I added 2 brown enamel dots from Your Next Stamp to the sentiment rectangle. I love this card and anyone who knows me well knows that I love my coffee and yes my creativity is fueled by coffee! 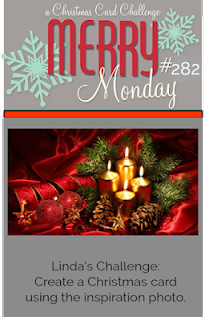 I hope you like this sketch challenge and we would love to see you play along with us this week. 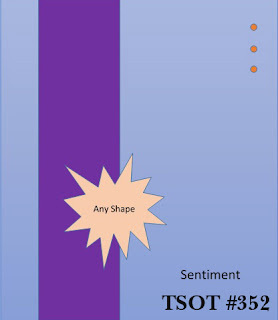 Who knows, your card might be featured as a top three!